'Tis the season for ribbons and wrappings. So instead of reading book reviews, why not make some recycled art? This collage is made from tissue paper, gift wrap, a bread bag, some ribbon, and a piece of cardboard from a used-up spiral notebook. I think there's a bit of glitter sprinkled in there, too. You don't have to make trees. I did because that's what I see when I look outside my windows: trees. But maybe you see snowmen. Or kids on sleds. Or ice skaters and hockey players. Or scarlet macaws and passion flowers. 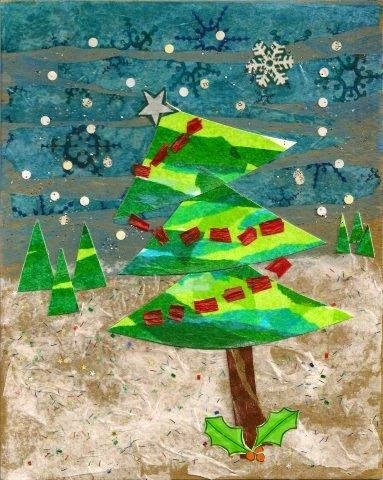 Make some glue (1/2 white glue, 1/2 water), grab a brush, tear some paper, and let the season inspire you. It’s bedtime and Dad is reading Emily and little Elmer a story. It is, in fact, the very book we are reviewing, and it features two very bad villains: Filth and Vacuum. And today’s the day they will destroy the world! Dad reads a comic-book version of the story in which Brad Forty, a very nice guy, must act fast. Because Vacuum guy is sucking all the money out of the banks, and Filth guy is polluting muck and slime along the beaches. He texts the Mayor a warning. The Mayor sends for Steel Man, but he is no match for the Two Terrible Villains. So the Mayor sends for Super-flying-through-the-air-very-fast man. But he is not fast enough. When the Mayor exhausts his list of superheroes, Brad says, “send for Extremely Boring Man!” Who is (yawn) very (snore) boring… and Dad thinks his little ones are fast asleep. “Oh No, we’re Not!” shouts Emily….. they want another chapter. 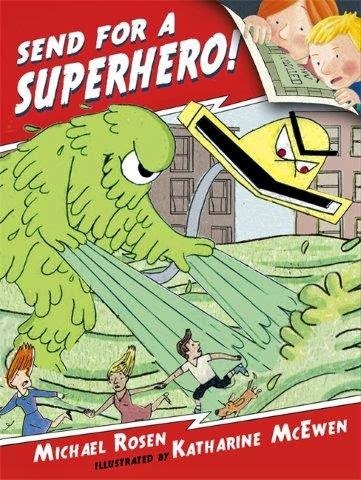 This is the perfect book for kids who love superheroes - even the less-than-super heroes. Best served on a rainy day with a side order of drawing paper and colored pencils and bath-towel-capes. This is the true story of how one crazy idea led to recycling, teamwork, and a new school. It is about Fernando and his friends who go to school in a small town in Guatemala. The students squish into the classrooms, with two kids at each desk and two classes in each room. Some days it is too noisy to think. 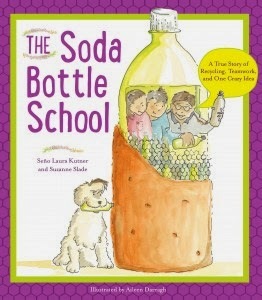 Then one day the crazy idea hit: could they build a bigger school using old plastic soda bottles? Before long everyone was involved collecting bottles and stuffing them with old chip bags and plastic trash to make them stronger. These were "eco-ladrillos" or eco-bricks. then they stacked the bottles between chicken wire, and later they covered that with cement. And finally, they painted the walls orange. But the story doesn't end there. Kutner is donating her portion of profits from the book to Trash for Peace, and Slade is donating hers to Hug it Forward. Both organizations are funding bottle schools. Sally: What inspired you to write this book? Suzanne: In the summer of 2011, I was checking out the annual Folklife Festival on the National Mall (Washington DC) when I saw a colorful plastic wall sparkling in the afternoon sun. As I approached it, I noticed children stuffing plastic bags and trash into soda bottles with sticks. They placed the trash-filled bottles inside a frame made of wood and chicken wire. Nearby, a poster held photos of children constructing tall plastic walls—an entire building—out of trash! Their elementary school, the Escuela Oficial Urbana Mixta de Granado, had become over-crowded. Two grades shared one classroom. Two students sat at one desk. The situation looked hopeless, until the villagers got this crazy idea. Could they build new schoolrooms out of their trash? Sally: Tell me about the process you use to research and write, and how you worked together with your co-author, Laura. Suzanne: For all my stories, I do a great deal of research up front. It's crucial to know the details about the facts I plan to use – as well as background information - before I begin writing. Although my writing budget couldn't support a trip to Guatemala, I was fortunate to have many great research sources. An ABC news report on Earth Day provided video footage of the project so I could hear the sounds and see the sights of Guatemala. Laura's Granados photo collection was very helpful--especially when it came to understanding what happened during the various construction phases. At the beginning of the book project I met with Laura, and then followed up with numerous phone conversations. I have pages and pages of notes from those discussions. Around revision 138 we decided to tell the story through the eyes of a fourth grade student at the school named Fernando. Since Laura had taught at this school and knew the students (and Spanish!) well, she acted as the go-between and talked with Fernando and his mother. In the end, I'm very pleased to have had the opportunity share the inspiring story of how students in Granados built their school out of trash (and cleaned up their town.) And I'm even more pleased to be able donate my profits from the book to fund new bottle schools! Sally: You have an engineering degree - and I notice that 3/4 of your recent books have to do with architecture: The House that George Built; Soda Bottle School; and With Books and Bricks. Does your training help you see the world differently? Suzanne: I don't know if my engineering background helps me see things from a different perspective, but the research skills I developed during college help me stay organized and keep digging while doing research for a new book. I also suspect my lifelong interest in science draws me to certain topics, such as cool building projects. I was fascinated to learn that, when George Washington decided to build a house for the president, his colossal project required so many people, skilled and unskilled, to complete. I was inspired to write With Books and Bricks after I read Booker T. Washington's amazing autobiography, Up From Slavery, and learned that he made thousands of bricks by hand. He dug the clay, molded the bricks, and fired them in a kiln! Sally: Anything in the works? Suzanne: I just finished reviewing the final proofs for a new picture book, The Inventor's Secret, which releases from Charlesbridge in 2015. It shares the fascinating (and true) story of how Henry Ford discovered the secret of one of the greatest inventors of all time - Thomas Edison. Today we're joining the roundup over at the Nonfiction Monday blog where you'll find even more book reviews. Review copy provided by publisher. "One hundred years ago, a horrible war began. It was the biggest conflict the world had ever seen." 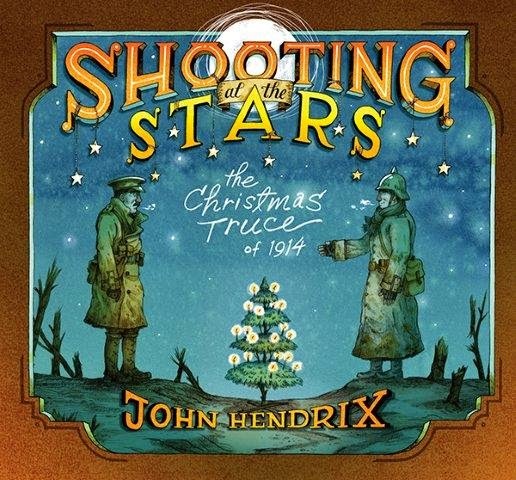 In this fictionalized retelling, John Hendrix imagines the Christmas Truce of 1914 told from the perspective of a young British soldier, Charlie. The story is based on letters and interviews with real soldiers who were in the trenches during that period of time. But Hendrix tells it through a letter Charlie writes to his mother. Charlie tells about how close they are to the Germans - only 30 paces separated the trenches between the warring sides. He tells about the mud, and how hard it is to keep his feet dry. And he tells about the miracle of that first Christmas eve on the front, when Germans and British soldiers put down their weapons for a day of peace. I also like the author's note at the back, along with a photo from the Christmas Truce of 1914 and a glossary. Beyond the Book: For kids who just can't get enough history, head over to history.com for more info about the Christmas Truce. If you're wondering whether they really did play soccer, check out this letter written from the trenches in France by a British general. H documents the troops laying aside their arms, exchanging gifts, and playing that oft-cited Christmas game. Listen to John McCutcheon sing Christmas in the Trenches and check out this bit of footage from the film, Oh! What a Lovely War. Play a game of winter soccer. Invite friends and neighbors over for a post-Christmas dinner game of soccer, even if it means stomping down the snow so you can kick a ball. Don't be too serious about choosing teams or how many players are on a side. If you don't have a soccer ball, don't worry. Neither did the soldiers in WWI. They used empty tins, but you can wad up all that used wrapping paper and tape it and tie it into a ball. Then, when you're cold and wet, make some hot cocoa. The soldiers shared their chocolate bars, but you can have your own cup. Sharing marshmallows is optional. Sweaty Suits of Armor: Could you survive being a knight? When my sons were of a certain age they decided that what they really wanted to be when they grew up was knights in shining armor. They snuck the colanders from the kitchen and used them as helmets. They turned tomato stakes into swords and pot lids into shields. They also watched every version of King Arthur (and any applicable Monty Python movies) that I would allow. What they really needed was this book, because Chana Stiefel lays it out like it was back in the day: those heavy metal suits of armor were stinky and hot! Not only that, knights had to eat bad food, wield heavy swords, and were often taken prisoner and - if lucky - ransomed off. The unlucky ones were chained in the dungeon. Stiefel strips the romance from the Middle Ages with language that is clear, fun to read, and so descriptive you can smell the sweat-sodden padding beneath the armor. She describes life in the Middle Ages war zone (no MREs), how to train for a knight (blood, sweat and tears), and the weapons of war. At the back of the book is a handy glossary and list of resources for the would-be warrior. And an index! I met Chana at the 21st Century Children's Nonfiction conference this summer, and she's a wonderful person - as well as being an awesome writer. She graciously answered Three Questions about her writing. Chana: After writing a book about the science of fingerprints for Enslow Publishers (Fingerprints: Dead People Do Tell Tales), my editor contacted me to see if I’d be interested in writing three books for their new series about the “Yucky Middle Ages.” Did I know anything about sieges, swords, sewage, and suits of armor? Nope! Would I love to write this series? Of course I would! 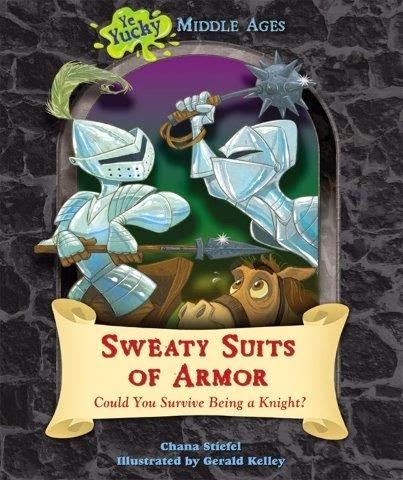 Sweaty Suits of Armor came out at the same time as my other two books in the series, Ye Castle Stinketh: Could You Survive Living in a Castle? and There’s a Rat in My Soup: Could You Survive Medieval Food? Writing these books was an incredibly enjoyable (and gross) learning experience. Sally: Talk about your process for researching & writing these books. Chana: My background is in journalism, so I’m trained to dig up fascinating facts. I read every book I could find about knights, castles, and the food of the Middle Ages. I trolled the Internet, and I visited the magnificent Suits of Armor Collection at the Metropolitan Museum of Art in New York City. You can see medieval armor and weapons in books and online, but when you stand next to them, you get a real sense of their heft, their artistry, and the brutality of war. You also come up with interesting questions, like how did knights go to the bathroom with all that armor on? And how hot did a knight feel when he wore a metal suit in August? My husband and I had also visited medieval castles in France so I had a good frame of reference for murky moats, poop chutes (medieval toilets), and dark dungeons. There is nothing like seeing these incredible structures in person and imagining what it was like to live there 1,000 years ago. I took note every time I came across something “yucky” and organized my facts into categories (for example, the hardships of training to become a knight, the weight of metal armor, nasty weapons of war, disease, lack of refrigeration, and so on). A professor of medieval history was also a great resource in helping me check my facts and making sure I had the right balance of historical accuracy and yuckiness. Sally: What have you got in the works? Chana: Last year, I signed with an awesome literary agent and sold my first picture book, Daddy Depot, which will be coming out from Feiwel & Friends in 2016. I’m now writing several other picture books, as well as my first Middle Grade novel, which is a mind-bending exercise. I’m also continuing to write non-fiction, including a book about safari animals coming out in May 2015 from Silver Dolphin Press. Check out Chana's website at www.chanastiefel.com. Today we're joining the roundup over at the Nonfiction Monday blog where you'll find even more book reviews. We're also hanging out with the bloggers who review mid-grade books at the Marvelous Middle Grade Monday round-up. Review copy provided by author. If you are looking for some good books to share for Hanukkah, check these out. One Saturday morning, just like every Saturday morning, a delicious smell wafted from apartment 5-A. This wonderful aroma tickles Tommy Santiago's nose, tempts Signora Bellagalli, tantalizes Mr. Moon, and brings smiles to the Omar family. Because they know it is Goldie's wonderful slow-cooking stew she calls cholent. And they know that they'll be invited to share the Shabbat meal. Everyone brings comfort food from their own culture and they set the table and serve it up. It's not cholent, but it tastes like Shabbat all the same. Rockliff includes a recipe at the back. I am one lucky dog! Imagine a mutt like me picked as a Hanukkah present. 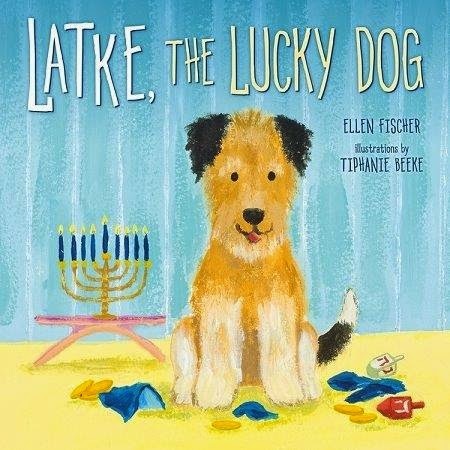 Latke's story begins at the animal sheter, when Zoe, Zach and their parents stroll in looking for a dog that's not too big and not too small. They bring Latke home on the first night of Hanukkah and he promptly climbs onto a dining room chair and eats the jelly donuts. That's OK, though, because the kids think he's hungry. "I am one lucky dog!" says Latke. 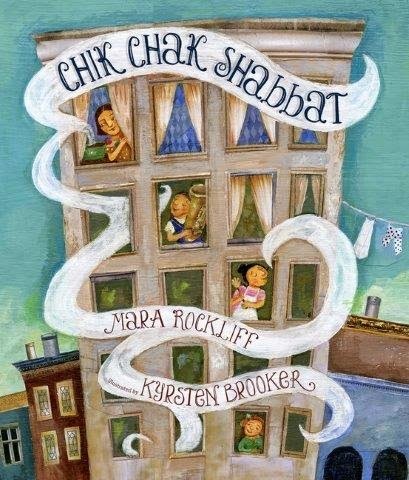 What I like about this book: Latke gets into new trouble each day of Hanukkah. He unwraps gifts, eats the latkes,chews on dreidels.... but despite his mischief, the kids forgive him because he's still adjusting to a new home. But by the eighth night... Oh, I can't ruin the surprise. Beyond the books: Oh, definitely cook up some latkes and cholent. Try regular potato latkes first and then, when you're more adventurous, maybe fry up a batch of curried sweet potato latkes. Cholent is the original slow-cooked stew. You'll find a yummy recipe here - it's not Goldie's but it'll do. Invite friends to bring their favorite "winter comfort" foods to a holiday pot-luck meal. Winter is a good time to invite the neighbors over for food and hot cider and a game of Parcheesi or cards. It's fun to taste what other people love to eat, whether it's macaroni and cheese or black beans and rice. Learn something about winter holiday customs from a culture that's not yours. A game, a song, a dance, a costume, a decoration, a food or drink... it's fun to learn something new. Today we're joining PPBF (perfect picture book Friday), an event in which bloggers share great picture books at Susanna Leonard Hill's site. She keeps an ever-growing list of Perfect Picture Books. Review copies provided by publisher.